I typically don't 'call out' brands on this blog for doing the wrong thing, but I had to share with you the most extreme case of greenwashing I'd seen in awhile (a discussion on greenwash follows this tale). I was contacted by a wooden watch company asking me to write an article about their latest product in exchange for a watch valued between $1000 and $5000 (this price point was the first red flag). The key selling point? 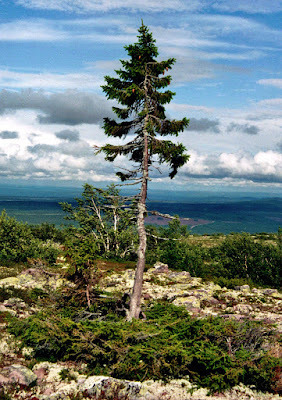 They were going to, and I quote, "Take down the world's oldest tree", Old Tjikko, who resides on Fulufjället Mountain in Sweden. Yes, you read that correctly - they wanted me to write about a watch made from killing the world's oldest tree - currently aged 9,558 years. an important role in some climate change research. Look, I get it, wooden things are made of trees. But no conservationist in her right mind would propose using an old growth tree for making consumer goods. And why in the world would a company contact an environmentalist to spruik a product made from a tree that is over 9,500 years old?! After I made sure the media release was not dated April Fool's Day, I wrote back to the company asking for more details on why Old Tjikko was coming down, admitting that I was quite shocked to read that this was their plan. I suppose I was hoping that perhaps Old Tjikko was dying and being cut down anyway, and that the company wasn't just trying to make some cash off of what they perceived to be a lucrative opportunity (because whether I like it or not, there is definitely a market who wants products with this type of notoriety). The response I received from the company was another head scratcher - without telling me anything about why Old Tjikko was coming down, they wrote of the substantial "regulatory hurdles" and that they planned on going to environmental court the next month. Also telling me "I hope to have some good news for you over the coming weeks". Good news for me would mean the tree was not being cut down . . . I gave them one more chance and asked again what the reason was to 'take down' Old Tjikko. In response I received more of the same, with the added bonus of being told how much they've already paid in legal fees ($100,000USD), that they expect to go to court at the end of the month, and how much they expect to spend in legal fees altogether ($670,000USD). All of this to produce 500 custom watches. But don't worry, they plan on planting 100 new trees for each watch sold. BUT WHY ARE YOU KILLING THE WORLD'S OLDEST TREE?! At this point I was incredibly irritated and took to the internet to find out what I could about the tree. Thanks to the magic of Google, a good Swedish friend, and a kind Swedish artist who has spent time with Old Tjikko, I got in touch with a representative at the forest. He was as shocked and appalled as I was - well, probably a great deal more, to be honest - and over the course of the day I received three emails from him assuring me that Old Tjikko is well protected and not coming down, that his boss agreed the tree was well protected, and that his boss checked with her boss at the Swedish EPA who also confirmed there was no way Old Tjikko was coming down (particularly not to make watches). "As the tree is within the national park, it is protected for all foreseeable future." I cannot even express the relief I felt at learning this news. I think with all the troubles in the world right now (with greedy companies taking advantage of people who want to save the planet just a tiny part of the problem), I really needed to hear some good news and to know that there are true environmentalists doing the hard work of protecting nature from the likes of this watch company. Feeling like a tree-saving sleuth, I eventually emailed the wooden watch company and told them that my environmentalist values had led me to contact the forest representatives and what I had learned about the protected nature of Old Tjikko. I also told them that, "At any rate, I cannot in good conscience support the cutting down of this tree to make any product unless there is a sound reason to do so, which there does not appear to be." Within a day, the media release announcing this product was off their wesbite and the Wikipedia page of Old Tjikko was returned to normal (some 'marketing genius' from the company had added a sentence to the page stating that the company was going to make watches from the tree). So . . . the moral of the story? I guess there are a few. If something doesn't seem right to you, ask about it. And ask about it again. And if you're still not satisfied, don't buy the product. For every decent, well-intentioned brand, unfortunately there are many more willing to scam you, and the good brands have no trouble being transparent. Love old growth trees - and perhaps plan a trip to Sweden. You may not get to see Old Tjikko, he's very well protected, but it's nice to know he has some serious guardians protecting him from the likes of this watch company. I decided not to tell you the name of the company here, though if you tried hard enough I'm sure you'd find it (the media release is still on other news pages). They claim to plant a tree for each of their current range of wooden watches, but those watches aren't made of sustainably sourced wood, either. So if you're truly in the market for an eco-friendly wooden watch, stick with the original WeWood, and feel good about your decision. And don't reward blatant greenwashing and attempts to make a quick buck off your environmental values. I never heard from the watch company again, so I can only assume their motives were purely financial whether they actually used Old Tjikko or just wanted to create hype with a media release talking about it in this way. I feel very confident this company is not about the environment but about their bank accounts and an attempt to take advantage of the so-called 'cashed up green consumer'. It's reported that 'green' consumers will pay 10-20% more for products that have an environmental benefit, as those who endeavour to live a green lifestyle know all too well. There are multiple conferences dedicated to promoting products to this group of shoppers, 'sustainability' experts who are really just green marketing experts, and as a dedicated environmentalist, I often feel I'm fending off greenwashing attacks at every turn. Becoming a writer and a blogger has made this all the more apparent. Sometimes it's worth it - I'm happy to pay more so the person sewing my clothes is paid a fair wage and works in a safe factory, or that my produce is organic and free of toxins. Other times it can feel like a scam, as in the case of this 'eco luxury' wooden watch and other goods painted with a similar 'green' hue but not created with environmental values at their core. Have you been greenwashed lately? I'd love to hear about it . . . we can vent with each other. Also, a special thanks to Robin, who was an excellent support and sounding board during this stressful time of Old Tjikko - thank you!